Holes in the ground can be interesting to small boys who are wont to use them as places to hide or conduct certain taboo experiments with girls. However, some holes were better left alone. The street is littered with shards of roof tiles and the pavements, front gardens, and even the houses themselves are pock-marked with the nightly shower of iron rain. The boy studies the pavement before him as he walks, keeping an eye out for any large or interesting pieces of shrapnel lying half-buried in a pool of still molten tarmac. These early morning walks often prove rewarding but today’s pickings are slim: a curved sliver of fractured shell, two spent tracer bullets and a burned out incendiary bomb. The last is ten-a-penny but he collects it just the same. He walks past the spot where the big crater had been, filled now and levelled off by the sappers, but he is reminded of that glorious morning when the children had first discovered the deep circular pit. Round and round on the inner wall of the crater they had run, shrieking with excitement while their momentum held them horizontal, and the boy remembers seeing the world turn on its side as he careered around the inside wall of the pit. This game however, had only a brief life, since by late morning families in the area had been moved out and half the street cordoned off. The ladies cannot get to the shops and cluster around a policeman who man’s the roped off area. They complain about the long detour they will be forced to make and seem unconvinced by his explanation for this nuisance. This inconvenience sets the women tut-tutting; the long detour is a nuisance; they have to get their shopping done and there may be nothing left when they get there. Looking past the policeman the boy had seen two khaki-clad figures unrolling a reel of wire from the crater to where an army post is being set up. The women mutter their wartime curses against the ‘bloody Germans’ and the boy recognises a few of his friend’s mothers amongst them, there are no dads, in this world the mums rule the roost. The women reluctantly turn about to begin their long trek and, like a flock of chickens make off with their limp oilcloth shopping bags, still muttering and tut-tutting loudly amongst themselves. Later the bomb disposal squad had arrived with heavy equipment to dig up the bomb, and after rendering it harmless had swung the huge rusty cylinder in a wire net from the back of a lorry and made off with it suspended like a captive sea creature to be returned again to its element. The boy had watched sadly as the sappers filled in the crater, remembering the moment when panting, he had sat down to take a breather at the bottom of the great hole. He had been sitting right on top of the bomb, a fact which he can barely comprehend, but he had decided to say nothing of it to his mother. 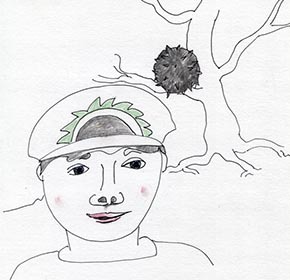 Just past the site of the crater is the tree from which the aerial mine had hung like a large black conker, its numerous spikes almost brushing the side wall of a nearby house as it swung in the wind. The parachute had also caught by chance in the guttering of the house, swinging the mine between the house and the tree. The Germans had recently been using surplus sea-mines in this way, sending them floating silently down by parachute to cause terror in the darkness below. A group of women had tried to get past a policeman who was blocking their way to the shops. As with the crater, they had muttered and cursed the Germans, while eyeing the mine as it dangled from its shrouds. They had seemed unafraid, and were the policeman not present would undoubtedly have sneaked past the mine, despite knowing that were it to go off it will take half the street with it. But the mine has been long disposed of, and reaching the end of the street the boy crossed to the other side and hunts the opposite pavement as he returns homeward. He knows the song well and his mother is singing along. He exits through the back door and stands outside looking skywards to see if anything interesting is happening above, but the usual tangled and looping vapour trails showing signs of aerial combat are absent and the sky is clear. The song comes floating through the open door to haunt him with its mysterious promise, he has never seen a bluebird, and had not known that Dover was home to such exotic creatures. On the western horizon the barrage balloons tug upwards like tame flying fish, swaying in great tethered shoals around the outskirts of the nearby city. He cannot imagine why the bluebirds have left, and wonders if that half-glimpsed tomorrow will ever come. This entry was posted on 13 February, 2014 in homepage and tagged Bluebirds, dave tomlin, nick victor, World War 2. Bookmark the permalink. Dave, sorry I haven’t been in touch… Hope you’re doing OK….These WW2 stories bring back many memories for me. Best wishes Mike&Dianne. Thanks Dave. I’ve really enjoyed these stories and think they give an excellent flavour of day-to-day life during the war. Although I was born after WW2 the tone and the feeling of the pieces mirror many of my own experience as a child in the 50s. Mike/Paul. Thanks for the kind words; it’s easy enough to sit back and press the like button but to put yourself out enough to make a comment is much appreciated.